For more information, read the article Controlling Aphids. Recently, I was growing some basil in our testing lab. When I came in after the weekend, I noticed that the plants in several of our containers were infested with aphids, but the basil that I had planted in a windowbox with marigolds were aphid-free. I had always heard that marigolds repel aphids, but now I know it first-hand to be true. Smartly written post and lovely marigolds. Perfect! 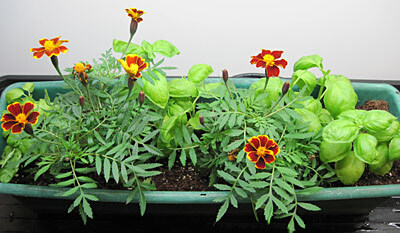 I put marigolds all around my vegetable garden b/c they really do help to repel aphids along with other bugs. There is a cream variety that is really pretty and grows crazy! How many marigolds do you need to plant?